Paying compensation to directors of tax exempt private foundations can be a delicate matter, especially for relatively modest family foundations. Most foundation managers are aware that such compensation is generally permissible under the Internal Revenue Code, as long as the compensation is not excessive and the services being provided are necessary to carrying out the exempt purposes of the foundation. Prudent managers may procure compensation studies which compile and analyze compensation data for comparable services and entities. In family foundations with small boards, it is often desirable to appoint an independent external “compensation committee” to evaluate such data and make compensation recommendations to the board of directors. Clients new to the world of private foundations (including clients who suddenly find themselves at the helm of family foundations) are often unsure of how to compensate directors, and if it is even legally permissible. This is not surprising, since, at first glance, the law in this area is puzzling, and several different pieces of the law must be fit together to reveal the full picture. Unfortunately, the crucial follow-up question “1b” is not nearly as straight-forward. In my practice, I have seen that even experienced preparers will sometimes answer it incorrectly or simply leave it blank. The awkwardly worded question, which cries out for an English teacher’s red pen, asks: “If any answer is “Yes” to 1a(1)-(6), did any of the acts fail to qualify under the exceptions described in Regulations…?” Unless a foundation is intentionally disclosing impermissible activity and including a check to the IRS for excise taxes, the correct answer to this question should be “no”. By answering “no,” a foundation informs the IRS that “yes” – the compensation (or other transaction) is within the exceptions to self-dealing described in the Treasury Regulations, and therefore is permissible and not subject to excise taxes. 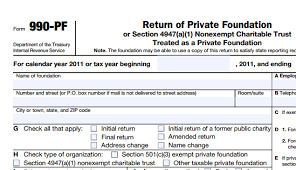 Perhaps what trips up preparers and foundation officials is the section heading for Part VII-B: “Statements Regarding Activities for Which Form 4720 May Be Required.” As most informed foundation managers know, Form 4720 is not a form you want to file. Form 4720 is used to calculate and pay excise taxes for activities that are disallowed under the Internal Revenue Code, and private foundations almost never have a reason to file them voluntarily. Since Part VII-B, Question 1b refers to the “exceptions” to “self-dealing,” preparers and managers may be eager to answer this question “yes” with the hope that doing so signals “yes, these activities were exceptions to self-dealing.” However, because of the clunky wording of the question, the answer should almost always be “no.” A private foundation intending to answer this question “yes” likely has bigger problems than bad grammar.